A number of people visit my blog on a regular basis after searching for “Rietveld chairs”. Although I usually talk more about his architecture, I do have a few posts about his chairs. I saw examples of most, if not all, of them during the special Rietveld Year exhibit at the Centraal Museum, but it’s always nice to come across them individually, even as part of another exhibit at the museum. That’s what happened Friday when I visited the Centraal Museum to see the Vrede van Utrecht exhibit (more about that in the future). Before seeing that exhibit, I took a look through another exhibit featuring art and artists related to Utrecht through the ages. There were some painting of Utrecht I haven’t come across before, as well as others that I’ve only seen online. It wasn’t all painting, though. There were also pieces of furniture and even some clothing, including a pair of shoes that I am still coveting. Not surprisingly, though, there were a few Rietveld chairs on display. As well as the obvious Red-and-Blue Chair, they also had the Steltman Chair (pictured above). This has always been one of my favorites, second only to the Utrecht chair. The various horizontal and vertical planes and the use of positive and negative space creates a chair that seems to shift and morph depending on the angle from which you view it. There’s a wonderful blog where someone has built a replica of Rietveld’s chair and he has a variety of photos showing just how much the chair changes, depending on the angle from which it’s viewed. The chair is known as the Steltman Chair, because Rietveld built it in 1963 (shortly before his death in 1964) for the Steltman Jewelry Store in Den Haag (The Hague). In fact, Rietveld designed the whole interior of the Steltman showroom, the chair being just one aspect of it. You can see a photo of the Rietveld interior on the store’s website. You can also see one of the original chairs at the newly redesigned and reopened Rijksmuseum in Amsterdam. 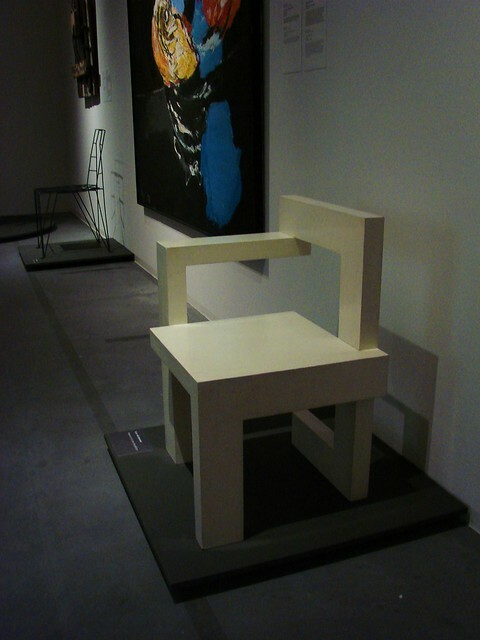 This entry was posted in arts, rietveld and tagged Centraal Museum, dutch furniture design, Gerrit Rietveld, modern chair design, photography, Rietveld chairs, steltman chair, steltman jewelry by Alison. Bookmark the permalink. Lovely blog – I find myself more and more getting into the design area. My interest in design has definitely grown since living here, not just because of Rietveld, but because of the ongoing Dutch influence on modern design. It’s fascinating to see the great things they come up with. I’m glad you’re enjoying it all, too.